Living in New York City automatically makes one limit all of her belongings, but none more than the kitchen appliances. Kitchens here are, as everyone knows, teeny tiny. Even the NYC multimillion-dollar apartments I've been a guest in have far less counter space than a modest suburban house. We actually keep half of our appliances under our cabinet with the pots, because the counter is just not big enough to keep everything out. It's not as bad as it could be, though: Many tiny kitchens substitute bar sinks for regular kitchen sinks. One of my past apartments boasted that feature, and we had to buy new dishes just so they would fit in the tiny sink when we washed them. Clearly, one must be conscious of each item she brings into her kitchen, so I'm not a fan of the tools that only do one thing. A margarita maker, for instance, is clearly not coming through our front door. Even when it comes to small tools, we try to choose ones that will mutitask whenever possible -- after all, those small things add up quickly. 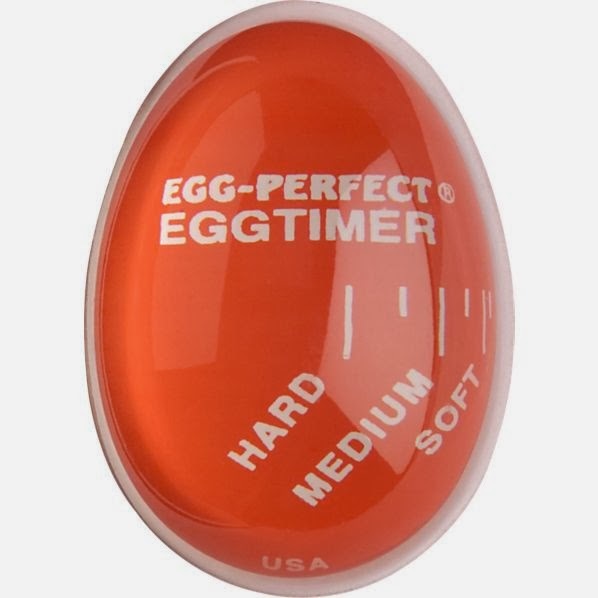 But there are a few items that are worth their space even when they perform only one job, and the Egg-Perfect Timer would be worth its space even if it were quite a bit bigger. Instead of using time to figure out when an egg has been boiled to perfection, the Egg-Perfect Timer uses temperature, which means that whether there is one egg in the pot or a half-dozen in there, it tells you exactly when the eggs are ready. It is not an expensive tool, and if one ever boils eggs, using it makes the process so much easier. It is an easy and foolproof way to keep those soft or medium-boiled eggs from accidentally turning into a tough super-hard-boiled mess, making a boring task full of nervous waiting into an easy and pleasant way to cook. Your article is very enjoyable...It's too good, I appreciate your work.